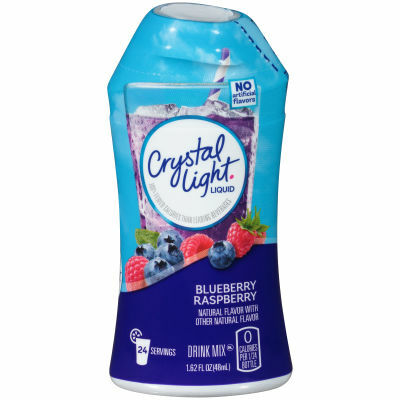 Crystal Light Blueberry Raspberry Drink MixThe all time favorite Crystal Light brings a new revitalizing Blueberry Raspberry drink mix that is sugar free, containing sucralose for artificial sweetness. Being USA certified, the product is made with precision and advanced formula and quality. It contains less than 2% of Natural Flavor, no juice or caffeine, pure drink mix for the pure hearted people.Leading Beverage with No CaloriesCrystal Light is proud to be known as one of those high quality products that have 0 calories in each 1/24 bottle, making it one of the leading brands offering such a healthy drink to be consumed by people of each age. Serving size 1/24 bottle (2 mL/about 1/2 tsp).